A consultant Spinal Orthopaedic Surgeon since 2009. Specialist in diagnosing, managing and treating back and neck problems in adults as part of a multidisciplinary team. This covers all aspects of spinal surgery including degenerative Spinal surgery, minimally invasive surgery, cervical surgery, kyphoplasty, vertebroplasty, spinal trauma. 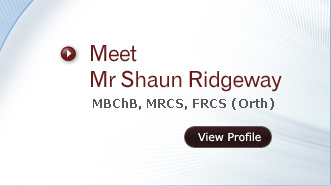 A consultant Spinal Orthopaedic Surgeon since 2009, Mr Ridgeway qualified from University of Cape Town in 1997. His Orthopaedic training took place in London with specialist and fellowship training in spinal surgery at Royal National Orthopaedic Hospital -Stanmore. He is a member of the British Association of Spinal Surgeons (BASS). 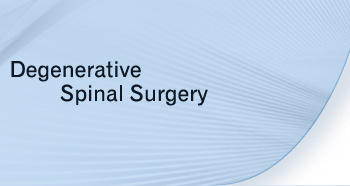 Mr Ridgeway has experience in all aspects of spinal surgery. Mr Ridgeway has particular interests in Degenerative spinal surgery, Minimally invasive spinal surgery, kyphoplasty/vertebroplasty, spinal trauma, and cervical spine surgery. He performs spinal arthroplasty surgery both in the NHS and privately. He has a particular interest in spinal trauma. Working out of 3 BMI Hospitals he provides a complete outpatient and inpatient service to patients with spinal problems. Mr Ridgeway lectures to national and international audiences on spinal surgery and is part of a minimally invasive spinal surgery training faculty. Outside work, he enjoys golf, canoeing, sailing and is married with 3 children. Mr Ridgeway has NHS Choose & Book Clinics at The princess Margaret Hospital Windsor, Spire Thames Valley Hospital Wexham and will shortly be commencing at OneHatfield Hospital. Please ask your GP to refer either on line Via the NHS Choose & Book Website or fax a manual referral to my office 0208 1505625.